Ballyscullion House, near Bellaghy, County Londonderry, was one of three grand residences built by the extraordinary Earl-Bishop, Frederick Augustus Hervey, 4th Earl of Bristol and Lord Bishop of Derry. It is not to be confused with the present Ballyscullion Park, erstwhile seat of the Bruce and Mulholland baronets (still inhabited by descendants of the Mulhollands). The Earl-Bishop's other seats were at Downhill, also in County Londonderry, and Ickworth, Suffolk. Ballyscullion was built close to the shore of Lough Beg, a small lough at the north-west corner of Lough Neagh; near the village of Bellaghy in County Londonderry. Construction on the house began in 1787 and, like Ickworth, its predominant feature was a central, domed rotunda joined by curved sweeps to rectangular pavilions. Below is an illustration of what the Earl Bishop's palace at Ballyscullion would have looked like, had it been fully completed. The central rotunda was virtually completed but ca 1803-04, it was almost completely dismantled to avoid the alleged application of the 'window tax'. 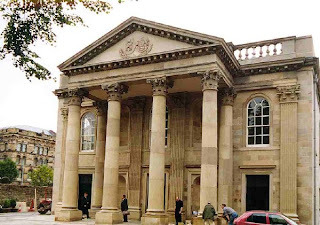 The portico at the front entrance door was taken away to Belfast where it can be seen to this day adorning St George's Church in High Street, Belfast. Ballyscullion House was apparently based on the 1774 house at Belle Isle, Lake Windermere. Belle Isle house (which still remains) is thought to have been based on the Pantheon in Rome. The episcopal palace of Ballyscullion was, in its turn, to be the prototype for Ickworth House in Suffolk, the Herveys' principal country seat. The Earl-Bishop lost interest in the house, afterwards known as the "Bishop's Folly", and it was still uncompleted at the time of his death in 1803, though inhabited and partly furnished. Ballyscullion and Downhill were bequeathed to the Earl Bishop's kinsman, the Rev Henry Hervey Aston Bruce, immediately afterwards created a baronet. Unwilling to have to maintain two great houses in the same county, the 1st Baronet demolished Ballyscullion a few years after inheriting it. Its fine portico is now at St George's Church, Belfast; some marble columns and chimney-pieces are at Portglenone House; and other chimney-pieces adorn Bellarena House. Some of the stone was later used to build the present mansion house, also known as Ballyscullion Park. The part-walled demesne was established about 1787 and the old palace is now denoted by a heap of rubble in woodland, having been partly demolished in 1813. Nearby stands the present house designed by Charles (later Sir Charles) Lanyon in the 1840s for Admiral Sir Henry Bruce, 2nd son of the 1st Baronet. Until recent years this house was the home of the late Sir Henry Mulholland, Bt, Speaker of the Northern Ireland Parliament. It overlooks Lough Beg and distant mountains beyond, affording fine views and incorporating the spire of a church on an island in the lough. This was added as a folly tower to provide an eye-catcher from the original house. The Earl Bishop chose the spot for his late 18th century building as he considered it, ‘… not to be inferior to any Italian scenery’. There are effective shelter belts in what is flat, exposed land. Near to the stable yard lies the part-walled garden, which is cultivated as an ornamental and productive garden for present-day family use. 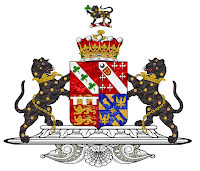 During Victorian times, the Bruce Baronets were the largest landowners in County Londonderry, with 20,801 acres. The history of the Hervey/Bruce families can be read in the Hervey/Bruce Papers deposited at the Public Record Office of Northern Ireland. Bristol arms courtesy of European Heraldry. First published in February, 2010. It would've probably been one of the grandest houses in the country, if the Ickworth-esque plans had been executed. The Mulhols still live there. As a Scullion, unrelated I suppose, I find the history facinating. I recently tried to find the house but on asking a local who surely should have known of its existance, I was directed over a mountain scenic route that seemed to have taken me of course. With no chance to retrace my route I missed the opportunity to see the old and new house. Stately Home Wedding At A Very Less Than Stately Price! There is something magical about the presence of a stately home. Ballyscullion Park is no exception and is simply one of the most prestigious Northern Ireland Wedding Venues. Situated centrally in Northern Ireland some 30 minutes from both Belfast and Coleraine, this property is a magnificent example of pure opulence and is the perfect choice for your up and coming wedding. It has just been announced by the owners that their first wedding reception to be booked for 2011 will be discounted from the normal price of £2000 to just £999 as an incentive for couples who have not yet booked their venue. Sir Charles Lanyon (1813-1889) the architect and engineer credited for designing and building many of Belfasts’ most famous landmarks including Queens College, Belfast Castle and the Public Library in Royal Avenue was the inspiration behind this resplendent property. Although his styles varied greatly he was most partial to the Venetian Palazzo style of architecture and Ballyscullion Park is a shining example of his work in this genre. Set in awe inspiring countryside by the banks of Lough Beg the property has stunning views over Church Island to the Antrim Hills beyond. You will be greeted as you enter the house with palatial rooms and access to the Victorian Walled Garden where your reception will take place. Photographers and videographers will enjoy the benefits of honeysuckle and roses providing the scenery and complementing the visual radiance of the two summer houses. Marquees can be erected here and specialist caterers can also be arranged. There are very few Northern Ireland Wedding Venues that have the appeal and grandeur of a property such as this and we thoroughly recommend you do not book any other venue until you have had the opportunity to see Ballyscullion Park for yourself.